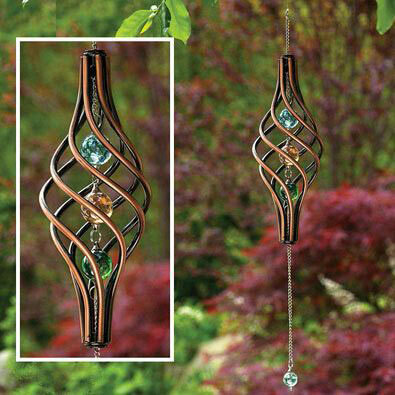 Our copper-finished Wind Spinner is a unique piece of outdoor decor for your lawn or garden. Sculpture rotates in the breeze. The twisted cage holds 3 iridescent marbles with 1 additional marble that swings from a metal chain. This copper Wind Spinner comes ready to hang. Place this dynamic shiny metal spinner on your patio and watch the show begin. During the day you'll see a fantastic spinning sensation with any gentle breeze. As night falls, the light show begins. Powered by an extra-large solar panel at the top, the bubble filled acrylic ball illuminates with seven cascading colors. Measures 7" wide x 10" long. Includes a carabiner for easy hanging in a sheltered area. Rechargeable solar battery with on/off switch included. Movement and light combine for a dramatic garden display. Two tiers of colorful metal petals spin in opposite directions. Nestled in the middle, the 3" diameter solar glass ball emits color-changing light by night. A slight breeze sends this spinner awhirl, while the solar powered LED cycles through vibrant colors after dark. Measures 27" diameter, stands 74" tall when fully staked and has a 10" fork for sturdy placement. Some assembly required. Made of airbrushed sheet metal and powdered coated steel. Instructions included. *Sorry, Gift Wrapping Not Available on Solar Multi-Color Tulip Wind Spinner.